Ankle sprains are the most common musculoskeletal injury and affect people of all ages. They are particularly common in activities with a lot of jumping or cutting, such as basketball and soccer. Additionally, simply walking on uneven ground, such as in a garden or on a cobblestone street, greatly increases the chances of an ankle sprain. Ligaments are soft tissues in the body that help hold bones and joints together, allowing them to function properly. A sprain means an injury to a ligament or groups of ligaments. It is important to understand that not all ankle sprains are the same. The “typical” ankle sprain affects the ligaments of the lateral, or outside, ankle and is called a “low ankle sprain.” A “high ankle sprain,” which is much less common, affects ligaments above the ankle in the end of the leg. Furthermore, ankle sprains are graded either 1, 2 or 3, depending on the severity of the damage to the ligaments. Grade 1 sprains mean stretching of the ligaments. Grade 2 sprains mean partial tearing of the ligaments. Grade 3 sprains mean full tearing of the ligaments. What are the symptoms an ankle sprain? Pain after an injury is a key symptom of an ankle sprain. 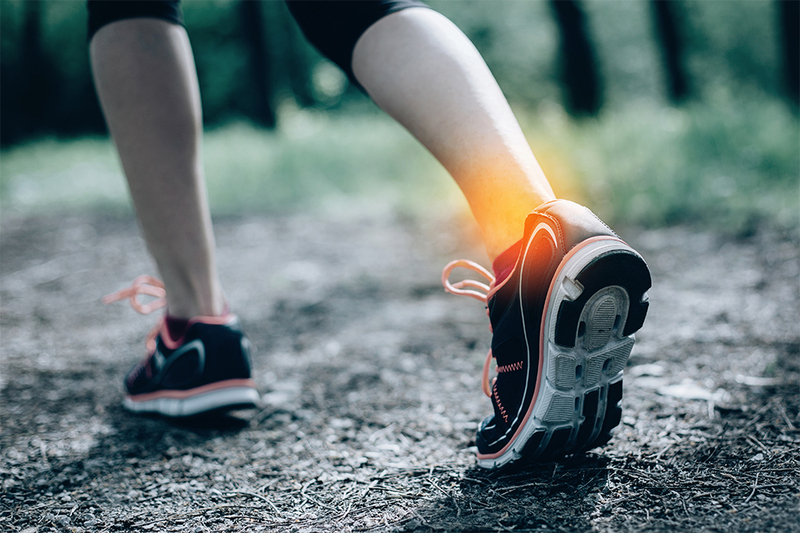 With a typical low ankle sprain, the injury usually involves the foot rolling in (called “inversion”) and results in pain on the outside of the ankle. With a high ankle sprain, the foot usually rotates out (called “external rotation”) and results in pain that is higher up on the ankle than a low ankle sprain. In some instances, people can injure both sets of ligaments and have a combined injury. Additional symptoms that are common are swelling and bruising, which can be quite impressive. And depending on the severity of the sprain, it may be difficult to put weight on the foot. Are some people prone to ankle sprains? Some people are predisposed to getting ankle sprains. Certain alignments of the foot and ankle, such as people with a high arch, make it easier to sprain the ankle. Also, people with “looser” ligaments in general are at a higher risk. Past ankle sprains, particularly those that did not properly heal, can lead to a “loose ankle” and recurrent ankle instability and sprains. The more often you sprain an ankle, the greater the chance that persistent problems will develop. If you have having frequent sprains or unstable ankles, you should see your doctor. The mechanism of the injury (inversion or external rotation) is an important clue for the diagnosis of an ankle sprain. A history of sprains or problems with the same ankle is another clue. Again, pain, swelling and bruising are common. To diagnose a sprain, your doctor will exam the injury and gently press on areas of the foot and lower leg to determine which ligaments are injured. The exam also may test the range of motion and stability of the joint by moving the ankle in different directions. The injury may require an X-ray to make sure there are no broken bones in the leg or foot, especially when it is difficult to put weight on the injured foot. It is important to note that MRIs are rarely necessary or useful in the setting of an acute ankle sprain. What is the treatment for a sprain? The grade of the sprain determines the treatment. Most mild (grade 1) sprains usually improve quickly with the RICE protocol of: Rest, Ice, Compression and Elevation of the injured ankle. These all help reduce swelling and pain. Nonsteroidal anti-inflammatory drugs, such as ibuprofen and naproxen, also can help control pain and swelling. Moderate and severe (grades 2 and 3) sprains often require additional treatment. Immobilization of the ankle with a removable cast-boot or brace is often used for a week or two to rest and support the ankle, and prevent further injury. Crutches may be needed for a few days. Once the pain and swelling have improved, a course of physical therapy has been shown to be very helpful with recovery. Physical therapy also helps to prevent future sprains and ankle instability. In general, high ankle sprains take longer to recover from than low ankle sprains. Sprains that are not improving over the course of a couple of months with the above treatment protocol may need further attention with an MRI. The MRI is not so much to look for a sprain but rather to assess for other rarer injuries that occasionally occur at the same time as a sprain. These can include tendon tears and cartilage injuries. Severe high ankle sprains that result in gross instability of the joint. To treat other associated injuries, such as a tendon tear or cartilage injury. Persistent instability and pain, even with extensive nonsurgical treatment. Surgery for persistent instability usually involves tightening the ankle ligaments to restore ankle stability. Occasionally, the native ligaments are in such poor condition that a tissue graft is needed to reconstruct the damaged ligaments. There is extensive rehabilitation after these surgeries to regain strength and range of motion. Warm up before exercise and physical activity. Pay attention when walking, running or working on uneven surfaces. Consider using an ankle brace on uneven surfaces or during particularly risky activities. Wear shoes that are made for your activity. Slow down or stop activities when you feel pain or fatigue. Perform exercises that help promote balance and coordination.